Building and Pest Inspection in Sunshine Coast - Noosa, Coolum, Peregian, Twin Waters and surrounds. Wayne is passionate about property and well-qualified, enjoying the challenge of communicating with clients, identifying the condition of a property and working with the stakeholders for the best outcome. 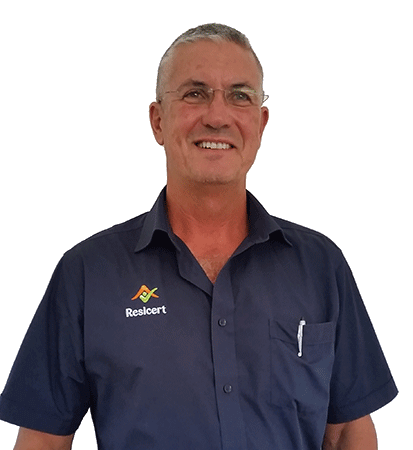 Because trust is critical in the property inspection business, Wayne prides himself in professionalism, being prompt, offering objective advice, and utilising the Resicert report system to deliver information that is in plain English. His goal is to ensure you understand all the issues regarding your property. If needed, Wayne will return to the site to explain trickier points. While testimonials speak for themselves, Wayne has built a business that has notable repeat business and referrals, accounting for a sizeable percentage of his business. His feedback after hundreds of inspections remains 9.3 out of 10. Making one of the most important decisions of your life is something Wayne understands and he has no hesitation in standing by Resicert’s 100% money back satisfaction guarantee. I now enjoy a more relaxed work / lifestyle balance allowing me to spend more time at home with my family or wherever there is good surf, a golf course or trendy cafe overlooking the ocean. This is life at Resicert and I am proud of the business I have, serving the northern Sunshine Coast community.